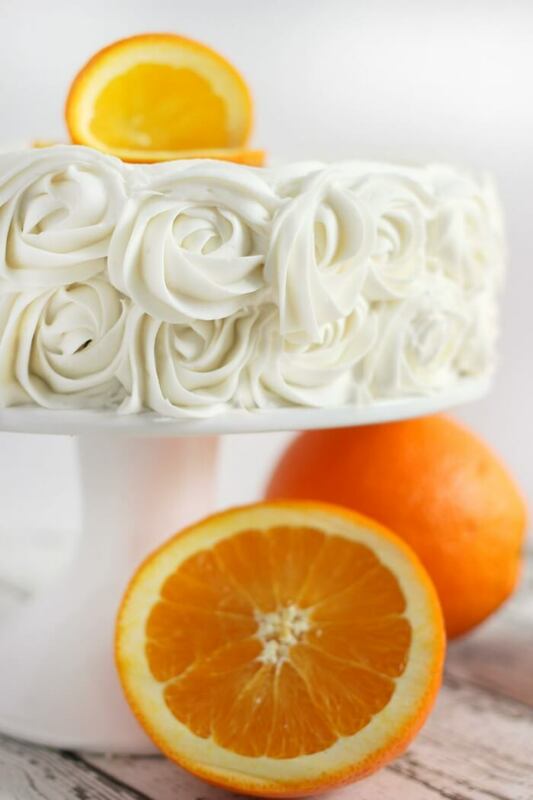 Orange Cake is so easy to make, we start with a box mix and use whole navel oranges to make the most moist and amazing orange cake recipe! I’m so excited about this orange cake! You know I love love love cake, so when I was in the market recently and saw a gorgeous display of oranges, it reminded me of an orange cake recipe I read in a waiting room years ago. There was a chef in the magazine who made the most decadent looking orange cake with whole oranges. Rind and all! So, I saw those gorgeous navel oranges in the produce section, and decided to just go for it! 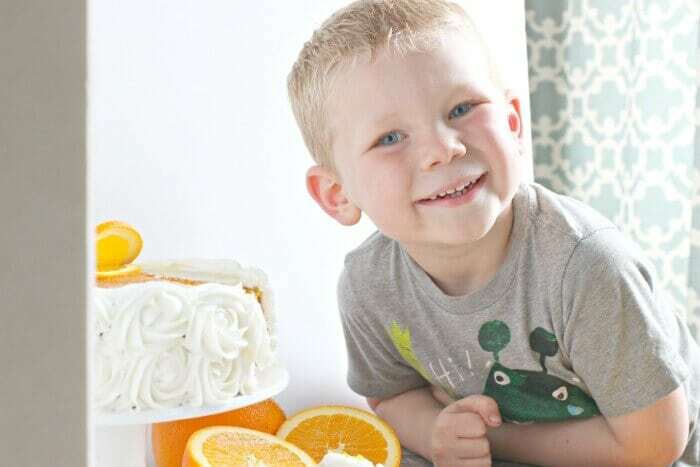 We used a box of vanilla cake mix, eggs, butter, and navel orange puree. 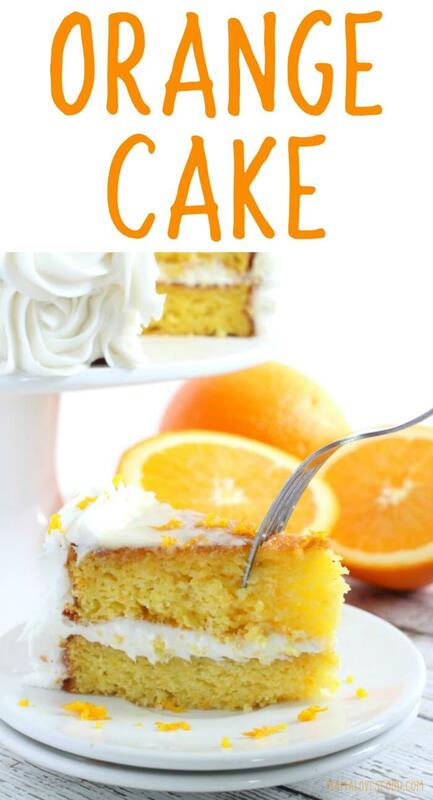 Orange cake made with cake mix and whole navel oranges is so easy and incredibly delicious! Just like in our Valentine’s Cake, we switched the oil for butter, and added an extra egg. 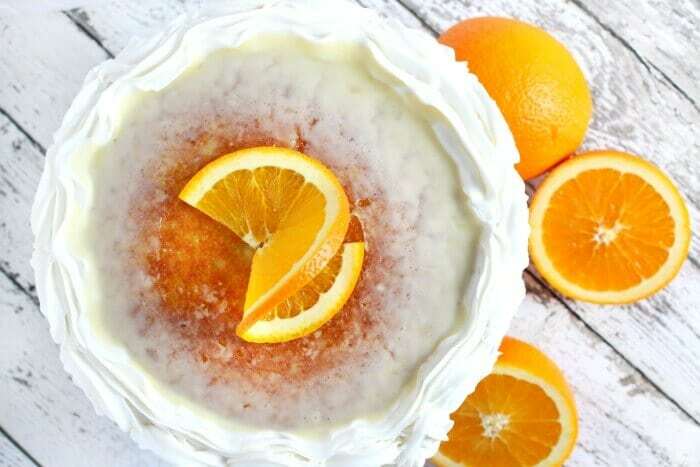 The cake is baked in eight inch rounds and then iced with both white icing, and a simple orange juice glaze. What Filling Goes with Orange Cake? 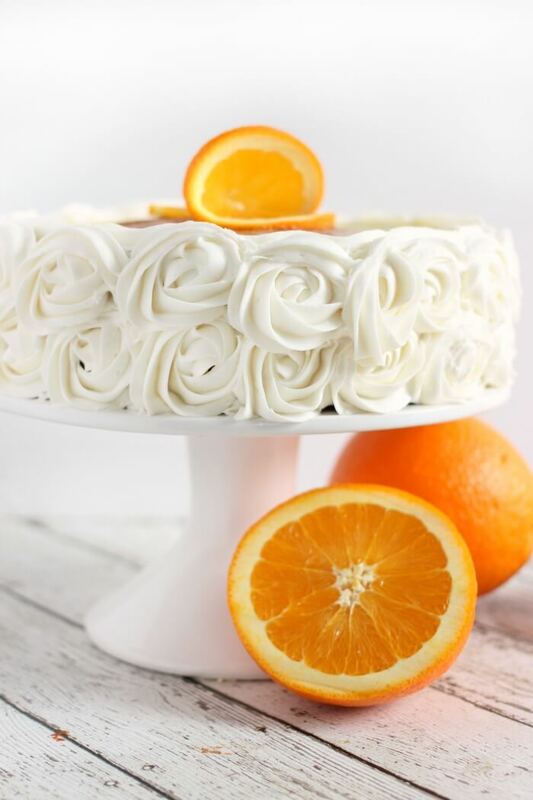 Orange cake is bright and citrusy, so we use a simple white icing filling to offset the bold flavor. It works perfectly and is such a classic combination. 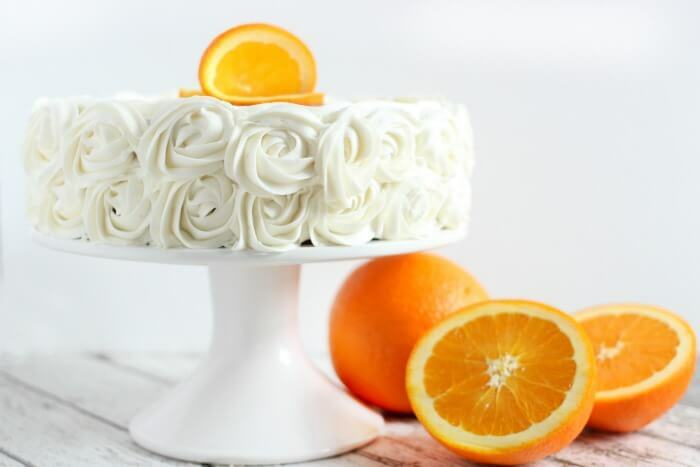 I love the way the white icing looks in contrast to the orange cake, but if you wanted to continue the vanilla flavor into the icing, that would be awesome too. How do you make Orange Sauce for Cake? We made a super simple orange sauce glaze for the top of the cake with powdered sugar, orange juice, and pure vanilla extract. The key to a perfect orange juice glaze is to start with the powdered sugar, and slowly pour the orange juice/vanilla mixture in until you reach the consistency you like. It takes very little liquid to turn the powdered sugar into a glaze or sauce, so make sure to do it in small amounts. Chocolate Overload Cake – Five layers of delicious chocolate on chocolate on chocolate goodness. Make sure to add alllllll the chocolate. Cranberry Upside Down Cake – Inspired by pineapple upside down cake, but more festive! This cranberry upside down cake is perfect any time of year. Double Chocolate Mocha Cupcakes – Who likes coffee and chocolate? Me! 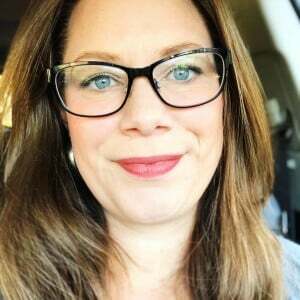 Me! Pretty sure the coffee in them makes these double chocolate mocha cupcakes suitable for breakfast. Mhhh Hmmmm. Spiced Apple Cider Cake with Salted Caramel Frosting – The trick to these apple cider cupcakes is apple cider drink mix and caramel squares. Simple, but sooooo good! Waffle Iron Strawberry Shortcake – Did you know you could make cake on a waffle maker? If you want practically instant cake, this is the answer. Salted Caramel S’mores Cake – Have you ever had a cake with pretzels? How about a cake with pretzels, and chocolate, and marshmallows, and caramel? Yeh, you’re not going to want to skip this one. Twin Pack Round Cake Pan, 8-Inch – Standard fare for making a two layer cake! Also good for small batch casseroles and cinnamon buns! 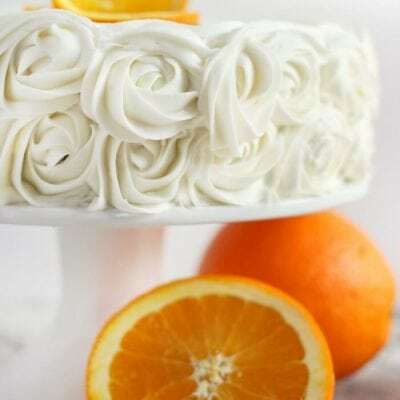 1M Open Star Piping Tip – This is my favorite piping tip and the one we use to make the rosettes on the side of our orange cake. Porcelain Round Cake Stand – What does a beautiful cake need? Well a pretty white cake stand to show off on! Tall Cake Dome – There’s nothing worse than finishing a gorgeous layered cake and then having to way to protect it. This tall cake dome fixes all that. And I love that it’s clear so you can still see your cake. I wasn’t sure how well this cake would go over with my kids, but holy heck what a hit! My four year old sat next to the table the whole time I was shooting pics and gave me plenty of direction. He’s officially the cutest. The orange makes the cake super incredibly moist, and I really think that’s because we use the whole orange and not just the juice. I was skeptical about whether it would work or be too bitter, but we couldn’t have been more pleased with how this orange cake turned out! You can also watch us make this Orange Cake on YouTube! Make sure to tune in for all our live cooking shows! 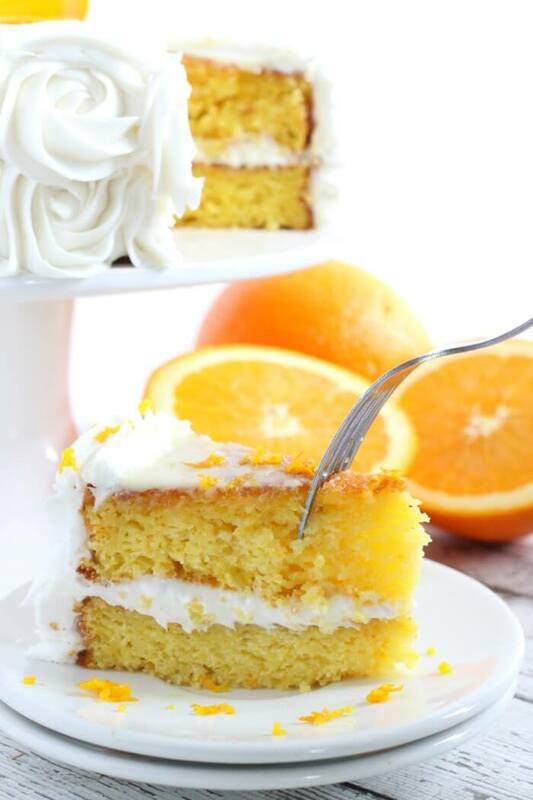 Orange Cake is so easy to make, we start with a box mix and use whole navel oranges to make it moist and amazing! Combine cake mix, butter, eggs, and orange puree and combine with an electric mixer. Pour into two greased 8 inch round baking pans and bake on center rack for about 30 minutes, until a toothpick comes out clean. Allow to cool completely. For the icing, while cake is cooling, whisk together 1 can of icing and 1 cup of powdered sugar. Add to a piping bag. For the glaze, in a small bowl add 1 cup of powdered sugar and vanilla extract. Then whisk in orange juice until you reach your desired consistency. When cake is cooled, spread remaining can of icing between layers. Then pipe powdered sugar/icing mix on outside of cake. To pipe rosettes, start in the middle then move the tip in a counter-clockwise spiral around the center. When the sides are covered, pipe a circle on the top of the cake, at the outermost edge, to keep the glaze from spilling over. Pour glaze on top of cake, and garnish with a slice of orange. Do you puree the whole orange or just the sections for the Orange Cake? Oh my goodness, I’m such a huge orange lover, and I’ll definitely be trying this soon!! I have seen Rick Stein and Nigella Lawson make something similar and have always loved both their versions. Now I have a third version….can’t wait to try it as orange cake is one of my favourite cakes. 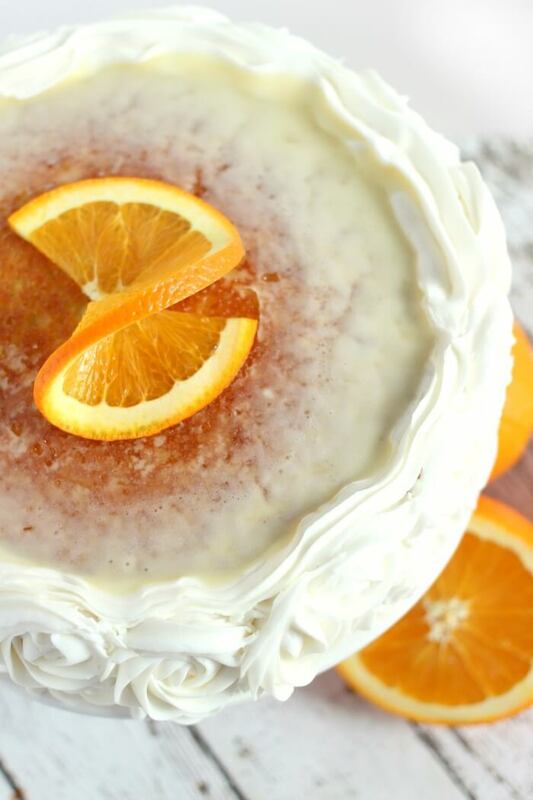 Orange cake is such a refreshing option for dessert. It’s always a hit at dinners and parties.